The goal of research undertaken by the center is to learn what women know about finance in both their personal and professional lives. Results contribute to improved financial education for current students and alumnae, as well as to the scholarship on women’s entrepreneurship in the United States and globally. GEM is the most comprehensive and longest running survey of entrepreneurship in the world. Since 1999, annual adult population surveys have produced a broad picture of entrepreneurship in over 100 economies, with data that include participation rates across phases of the business process, societal attitudes about this activity, and the characteristics, motivations and ambitions of entrepreneurs. GEM data have led to publications in over 250 academic journals, including top level journals in management, entrepreneurship, innovation and other fields. The policy and practitioner community use GEM information to assess entrepreneurship in their regions and inform their decision making.Additionally, national and global level media attention disseminate valued knowledge and boost the reputation of GEM and its member institutions. Women’s entrepreneurship is an increasingly popular topic for study and action in the academic, policy, and public and private sector communities. It is a frequent focus of academic research publications based on GEM data. Around the world, policy and public/private institutions are concerned with improving conditions for women’s business, increasing women’s participation in entrepreneurship, and facilitating high quality activity that may include growth enterprises and knowledge-based industries. 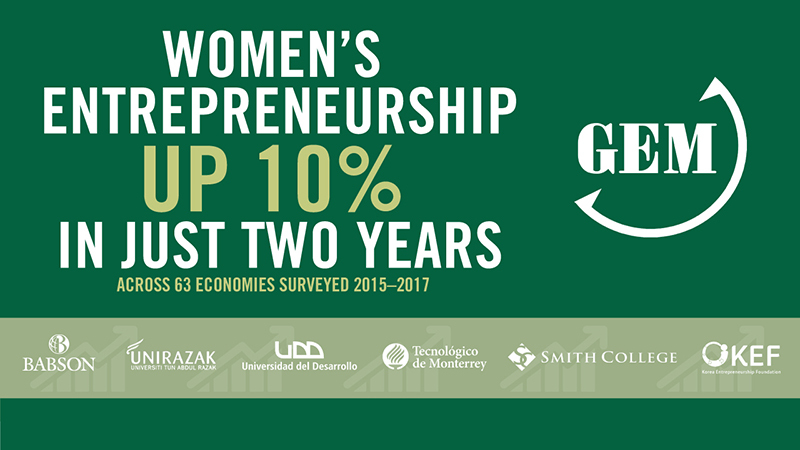 Over the past year, nearly 300 million women were starting or running businesses around the world—this according to the Global Entrepreneurship Monitor (GEM) 2016/17 Women’s Report with sponsors Babson College, Smith College, Korean Entrepreneurship Forum, Tecnológico de Monterrey, Universidad Del Desarrollo, and Universiti Tun Abdul Razak. In October 2009, the Center for Women and Financial Independence launched a pioneering survey to study educated women's financial knowledge, behavior and attitudes towards money. Over 4,500 Smith College alumnae completed the comprehensive online survey. The results from this rich dataset, that includes information about age, household income and type of degree obtained, is reported in a series of articles that examine how educated women learn about finances, manage their assets, make financial decisions, save for retirement, gage their sense of financial security and assess their own financial mistakes.